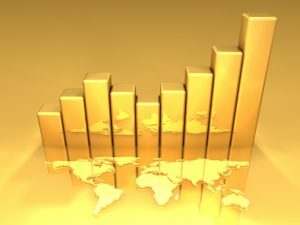 Banks are buying gold in record amounts these days, and the following list contains the ten nations who are currently holding the largest reserves of the precious metal. Gold is a pretty unique animal. It never rusts, spoils, degrades, or tarnishes. The fact that it doesn’t change colors when left out for hundreds of years is a fun piece of trivia, but it also points to the underlying, inherent value of the metal. Gold is a reliable investment that acts as the ideal counterpoint to paper currencies or the volatile equities markets. Big banks know this, and the world’s leading nations understand that maintaining an appropriate level of physical gold adds a dose of protection against market uncertainty, global economic or political concerns, and inflation. Here are the top 10 countries with the largest gold reserves. 10th largest: India — The vibrant nation of India currently houses a large percentage of the world’s foreign reserves. This equates to about 557.7 tons of gold, or nearly two 747 jumbo jets in weight. 9th largest: Netherlands — The physically small nation of the Netherlands is big on gold, to the tune of 612.5 tons of the precious metal. This is equivalent to about 120 full-grown elephants, in terms of weight. 8th largest: Japan — The Land of the Rising Sun holds gold close to its heart, a full 765.2 tons of it, at last count. This is equivalent in weight to 11 battle-ready Abram’s tanks. 7th largest: Switzerland — The Swiss boast the most gold reserves per capita in the world, amounting to a whopping 1,040 tons of it. This is the same as nearly 90 Ford Focus sedans. 6th largest: Russia — The world superpower understands the importance of gold in their own investment portfolio, as they currently hold about 1,460 tons of gold or the weight of 2,000 fully-grown Russian brown bears. 5th largest: China — The ancient Kingdom of China feels strongly about gold’s inherent value, and has about 1,797 tons of it in their reserves. This means there is enough for every 17 people in China to have an ounce of gold if you divided it up equally. 4th largest: France — Though France boasts a third as many people of Russia, it holds almost twice as much gold. Coming in at over 2,435 tons, the French believe strongly in the value of gold. Their gold holdings equate to roughly one-third the weight of the Eiffel Tower. 3rd largest: Italy — Gold is called “a reserve of safety” by those in charge of the Central Bank of Italy, which demonstrates why the nation holds about 2,451 tons of the precious metal. That is equivalent to about 3,000 gondolas. 2nd largest: Germany — With nearly 3,400 tons in their strategic reserves, Germany is a big fan of the yellow metal. This is about the weight of 1,800 BMW 3-Series coupes in gold. The largest: United States — Fort Knox is probably bursting at the seams these days with the U.S. gold reserves boasting a whopping 8,133 tons in strategic reserves. That is roughly equivalent to 3,200 Ford full-size pickup trucks in gold. These countries have something in common besides their penchant for gold – they are generally among the leading industrial nations on the globe. Gold is a tried-and-true investment vehicle that can help virtually anyone – from a novice investor to the leader of a large national central bank, create greater portfolio stability and overall financial performance. For more information about gold investing, contact American Bullion today.